Hemmer feet are very useful tools, but are rarely seen in useful sizes this large. The Janome Wide Rolled Hemmer Presser Foot Set includes three hemmers that all screw onto the included snap on presser foot. 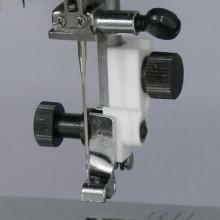 Simply pre-press the start of the hem, pressing under twice the width of the hem and feed it into the guide. 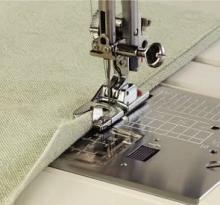 The guide on the hemmer turns under the raw edge and allows it to be easily stitched into place, giving you professional looking turned hems on most medium to heavy weight fabrics. Includes instructions. Watch our instructional video below to learn full details of what the Janome Wide Hemmer Foot Set can do and how to use it.